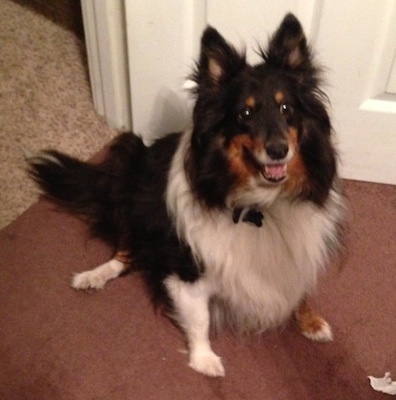 Java, our Shetland Sheepdog, actually invented a game you play with a piece of rope. He invented this game when he was about four and taught it to us by repeatedly forcing us to play it. I don’t know what Java calls this game because I’m not completely certain he has an internal concept of “language” or “names” so I’m calling it The Best Game because that is how he seems to think of it. If he were allowed to, Java would play this game and nothing else forever. I hereby submit this game to #objectjam on Java’s behalf. Here is how you play. A short piece of rope, say a little under a foot, preferably with one or more knots in it. Two players. Player Two has to be a human because they need to have hands. Player One can be anybody. Phase 1: Keep-away. Player One starts with the rope (Java holds it with his mouth because that is how he holds things). Player Two has to try to get it. Player One should stand as close as possible to Player Two (this is not a hiding game), but if Player Two tries to grab the rope immediately dodge out of the way. Phase 2: Tug-of-war. Player Two has now grabbed one end of the rope. However, Player One still holds the other end. Player One should hold on as tight as possible to prevent Player Two from taking it away. Phase 3: Fetch. Player Two, now that they have the rope, must throw the rope as far as possible, so that Player One can run really fast and go retrieve it. Player One then returns the rope to Player Two’s position, at which point Phase 1 restarts immediately. Tips for playing: Sometimes, people may not realize they are playing the game, or might think the game is done. In this case, Player One can try dropping the rope in Player Two’s lap; when they pick the rope up, Player One can immediately re-grab the other end of the rope at which point Phase 2 begins immediately. (This means you skip Phase 1 but this is okay because it’s a good way of teaching Player Two the game. You can ease in Phase 1 as they get the idea.) If Player Two doesn’t immediately react to having the rope dropped in their lap, maybe they didn’t notice you put it there. Try picking the rope up again and dropping it 3 or 4 more times. This entry was posted on Sunday, May 12th, 2013 at 1:28 pm	and is filed under Uncategorized. You can follow any responses to this entry through the RSS 2.0 feed. You can leave a response, or trackback from your own site. This might be a game that is somehow encoded in dogs at birth. We have two Aussies and both play it with us and with each other. The only thing they might prefer to the best game is nonstop belly rubs.